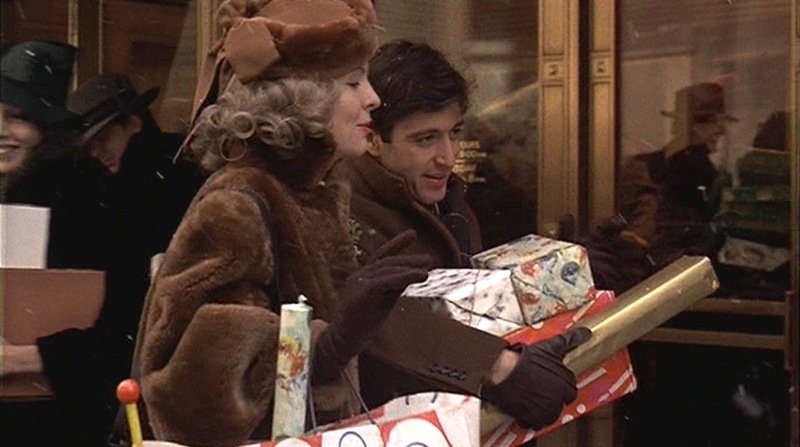 So, in the spirit of Monday’s holiday list post, follow Michael Corleone as he and Kay Adams go on a midtown shopping date at Christmas. Not yet a mob boss, Michael still dresses like the upstanding Ivy Leaguer he was before jetting off to war. His attire is much simpler and not at all indicative of the powerful gangster he will become. 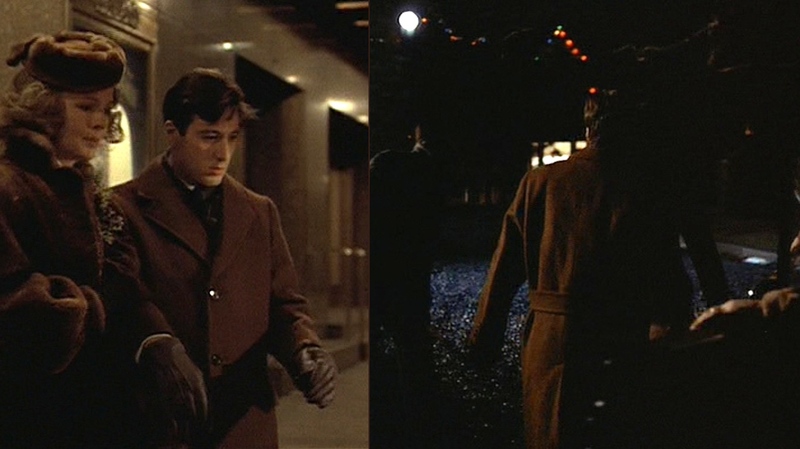 Since most of this scene takes place outside during a cold December day in New York City, Michael’s outerwear gets the most exposure. He wears one of his two brown topcoats. 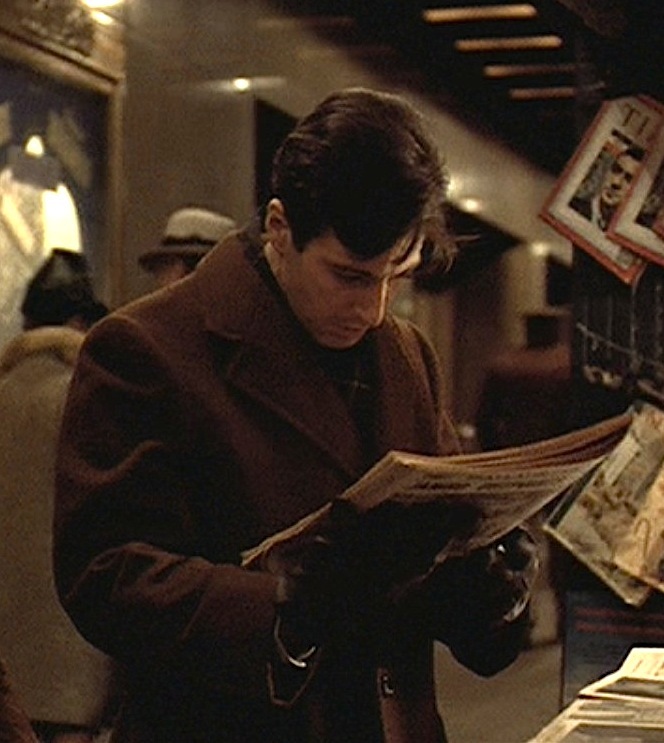 The overcoat featured in this scene is brown wool with a 3-button single-breasted front and notch lapels with swelled edges. The hip pocket flaps often find themselves tucked into the pockets themselves. Michael’s date quickly goes downhill when he learns that his father has been badly wounded in a gangland shooting. Most of us can relate, I’m sure. The four dark brown plastic buttons on the cuffs match the three larger buttons on the front. The overcoat also has a belted rear and a long single vent. Michael loosely wears a dark brown woven scarf with a white dotted-stripe overcheck tucked inside his coat. Many fans of the film, myself included, have noted that Michael doesn’t wear a hat until he is part of his father’s criminal enterprise (other than his USMC issued hat, which would argue that Michael only wears hats when he’s part of any organization.) It’s particularly noticeable in this scene as all of the other men around him are wearing fedoras but good old Michael braves the weather bare-headed despite sporting the other cold weather stand-bys like overcoat, scarf, and gloves. His short gloves are dark brown cowhide leather that rise no further than his hand, leaving the skin of his wrist and his shirt cuffs exposed to the elements when he bends his hand. 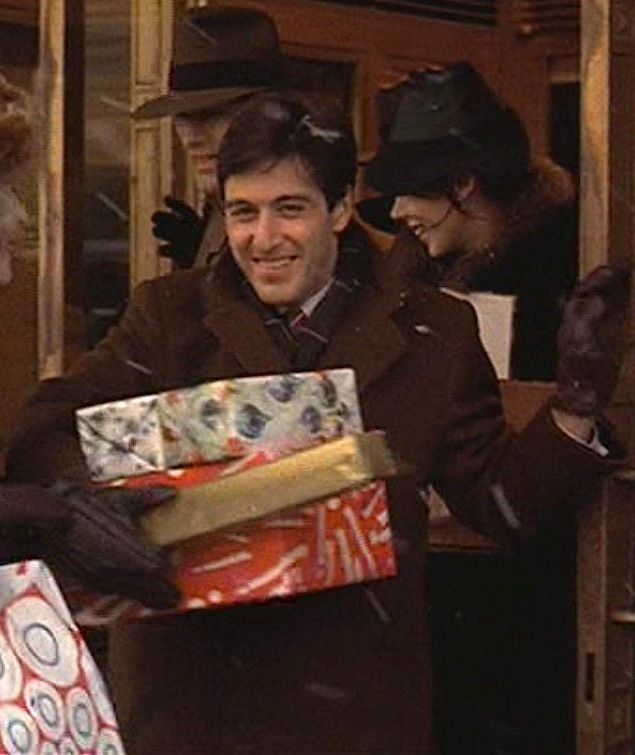 Wouldn’t it be easier for Michael to just put all those gifts in a bag? It’s particularly telling that Michael’s outerwear is all brown, evoking a more grounded, “salt-of-the-earth” personality and concealing the colder, more businesslike gray underneath. Brown is a very common color for Michael in these early scenes, from his USMC uniform at Connie’s wedding to his topcoats and accessories prior to “joining” the family. Once Michael assumes his spot on the Corleone crime family tree, gray becomes his color of choice. Under his overcoat in this scene, he wears a dark charcoal single-breasted sport coat. Not much is seen of this coat other than the large notch lapels which have swelled edges like the overcoat. His trousers also don’t receive much screen time, but they appear to be a pair of dark gray flannel trousers, similar to the pair he wears in the following scene with a flat front waist and cuffed bottoms. Michael’s shirt is one of the biggest differentiators between he and the gangsters around him. He wears an “all-American” striped cotton shirt with a button-down collar. The white plastic buttons continue down a front placket as well as a button on each cuff. The thin stripes of the shirt are white and dark blue, giving the shirt an overall light gray appearance when seen from a distance. Michael maintains his all-American Ivy Leaguer look with a maroon red silk tie with thin white stripes in the classic right-down-to-left stripe direction, very indicative of a classic Brooks Brothers repp tie. 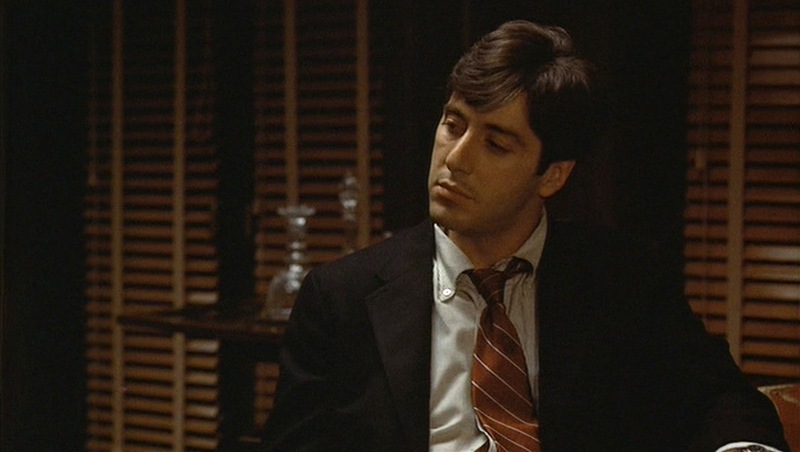 He wears this same shirt and tie during the game-changing scene where he shoots Sollozzo and McClusky and begins ascending the ranks of gangsterdom. Michael’s footwear of choice in these early sequences is a pair of brown leather 2-eyelet derby shoes with black dress socks, ignoring the trouser-matching-the-sock rule. His single accessory is a plain wristwatch that looks like it may be a Hamilton carried over from his military service. 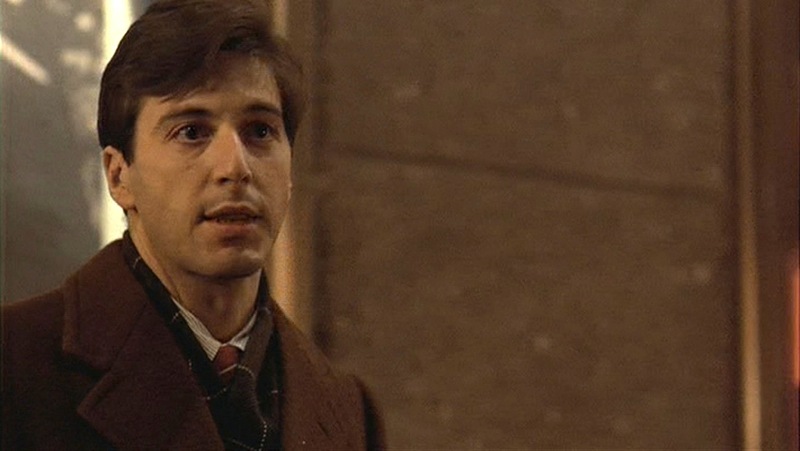 The whole outfit is similar to what he wears in the following scene when visiting his father in the hospital, although that outfit consists of a corduroy sport coat with a different brown topcoat and a different red striped tie. The similarities in the outfits show that, before his criminal career, Michael had a very defined sense of style that he adhered to without much deviation. Finally, their date concludes with a visit to the theater to see Bing Crosby and Ingrid Bergman in The Bells of St. Mary’s. Many local theaters often use the holiday season as an excuse to show some classic films; my girlfriend and I have made it a long-standing tradition to see It’s a Wonderful Life at the Regent Square theater in Pittsburgh as it gets closer to Christmas. Michael and Kay, being New Yorkers, naturally opt for the Radio City Music Hall in Rockefeller Center at West 50th Street and 6th Avenue. Michael Corleone’s early Ivy League style provides a nice template when you want to channel The Godfather for a holiday date night without being mistaken for John Gotti.